Urologist David Price, M.D. removes a 73-year-old man�s prostate while using the new da Vinci Xi Surgical System at CHI St. Luke�s Health Memorial Lufkin. LUFKIN, February 25, 2016 - As robotic technology continues to evolve, CHI St. Luke’s Health Memorial puts the most state-of-the-art equipment in the hands of the finest surgeons in deep East Texas with the addition of a new robotic system – the da Vinci Xi Surgical System. For the first procedure on the new robotic system, General Surgeon Gregory De’Armond, MD, FACS, removed an 83-year-old man’s gallbladder through just a few small incisions. Since then, other CHI St. Luke’s Health surgeons have also taken advantage of the system’s state-of-the-art design and functionality. Well-documented research shows that minimally invasive surgical procedures benefit patients in additional ways – reduced trauma to the body, less scarring, reduced blood loss, less post-operative pain and discomfort, less risk of infection, shorter hospital stay, and quicker return to normal daily activities. 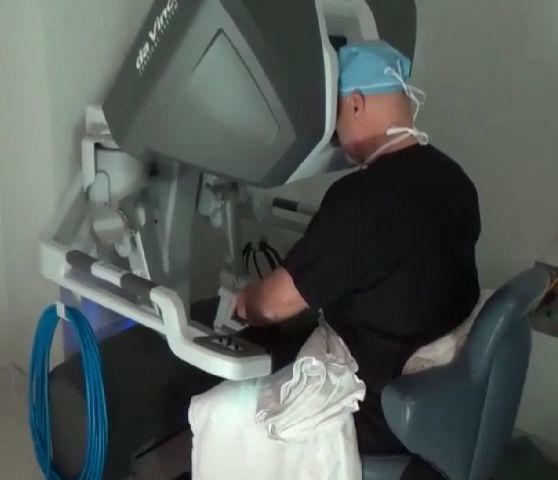 Being the first hospital in the state of Texas to acquire the da Vinci High Definition robotic system nearly a decade ago, Memorial values the importance of staying in the forefront of robotic advancements. Currently, more than 60 percent of the surgeries performed at Memorial are now done using one of the hospital’s two robots. “We are truly thrilled to be a leader in this field and look forward to continue bringing additional minimally invasive surgical options to deep East Texas,” said Shawn Barnett, CHI St. Luke’s Health Memorial COO & Lufkin President. The da Vinci Xi System was designed with the goal of further advancing the technology used in minimally invasive surgery by putting the surgeon’s hands at the controls to perform even the most complex and delicate procedures through very small incisions with unmatched precision. The System can be used across a spectrum of minimally invasive surgical procedures and has been optimized for multi-quadrant surgeries in the areas of gynecology, urology and general surgery. The Xi System’s immersive 3D-HD vision system provides surgeons a highly magnified view, virtually extending their eyes and hands into the patient. For more information on minimally invasive surgical options at CHI St. Luke’s Health Memorial visit chistlukeshealthmemorial.org. Also, to see video from a robotic procedure, visit our Youtube page.